DocRead is policy management software for SharePoint that helps target policies and procedures to groups of users in your organization. Any item that can be saved into a SharePoint document library or list can be assigned to a specific group of users so you can also assign office documents, videos, images and pdf's for example. Once assigned - DocRead tracks who has and has not acknowledged those documents via a suite of reports and charts. Find out about DocRead in just 45 Seconds! DocRead integrates seamlessly into Microsoft SharePoint, meaning that the policy and procedures life-cycle can now be entirely managed and controlled from SharePoint. This removes the need to store and maintain policies in multiple systems and also allows you take advantage of the powerful document management features that SharePoint offers. You may also wish to read more on why policy management in SharePoint is the most sensible choice. DocRead web parts and e-mails make it very easy to notify and alert users that they are required to read and confirm a policy stored in SharePoint. Target policies and procedures to tens of thousand's of users at once, by simply choosing a SharePoint group or rules-based audience. Receipts certify who read a policy and when - acting as a great auditing solution. Receipts can be accessed by the reader and administrators. Make the process of chasing non-compliant users hassle free, by slicing and dicing up to the second exportable reports. 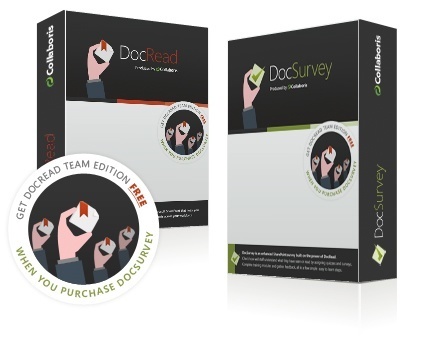 DocSurvey is an add-on tool for DocRead that requires a quiz or survey to be completed before the user can confirm. Have you heard about DocRead Smart Move? "Smart Move" refers to the technology that detects when a user joins or leaves a group or audience. DocRead is able to utilise Smart Move to ensure that your users only ever receive the correct policies and procedures. This makes it ideal for on-boarding, secondments, new project work, external contractors and many other uses. When we ask for feedback, Smart Move is often voted as DocRead's most powerful feature. Read how Smart Move can save you hours of manual administration.